An excellent option for both new and old slabs, scoring is an easy way to add depth and texture to an otherwise blank slate. Scored concrete features a series of groves that have been cut into the concrete to create a distinct pattern or design. 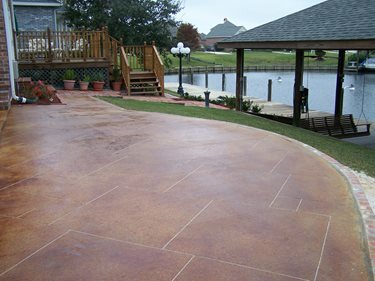 It is different from stamped concrete in that texture is not imparted onto the surface of the slab. Scoring, also known as sawcutting, can be done both indoors and out to achieve a variety of decorative effects. Before moving ahead with a scoring project, ensure that your concrete is structurally sound and has an intact surface. 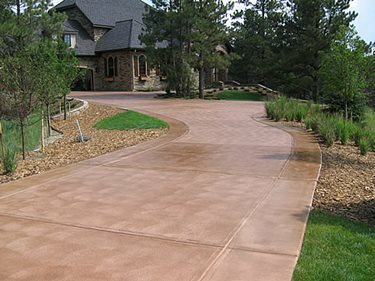 If there are unsightly cracks or spots where the concrete is chipping or flaking away a decorative concrete overlay may be the better solution. 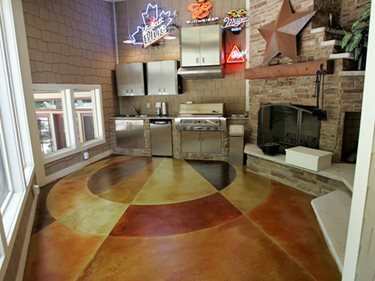 Design ideas for scored concrete floorsScoring can be used to create straight borders, bands, diamonds, stars, rectangles, or other shapes on the surface of the concrete and then stained to contrast with the abutting concrete. 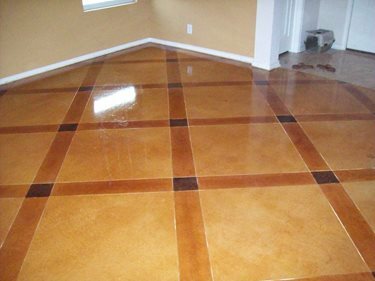 Scored and stained concrete floors are an economical option for homeowners compared to other choices such as hardwoods, which often have hidden costs (especially if you live in a multi-family dwelling that requires a cork base for noise reduction). The most popular and cost-effective scoring pattern is a large grid design, sometimes cut on an angle to look like diamonds and often stained a shade of brown to create the appearance of warmth. However, specialty designs such as this hand-scored vine or these custom logos can also be created. A scored grid pattern like those shown above is a great way to add interest to your concrete without over-spending. You can go with a basic, single color design as shown on the left or upgrade to a more complex version of the same pattern with multiple colors as shown on the right. Learn more about sawing and patterning. If you are looking for something with a bit more pizazz than the basic grid, consider adding some curved lines or even circles to your scoring design as displayed above. The photo on the left shows a grid pattern interrupted by a gentle arch, while the picture on the right shows two concentric circles with radiating lines. 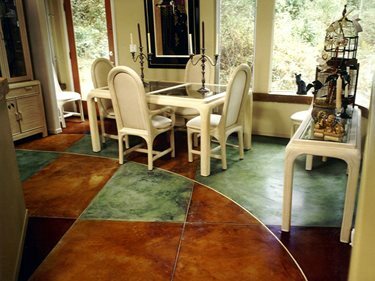 See more pictures of concrete floors. Furthermore, scoring can be used to cut the outline of a graphic or logo into your floor or to create a unique focal point. Circular designs, like the one shown in the image on the right, work particularly well in entryways and lobbies. 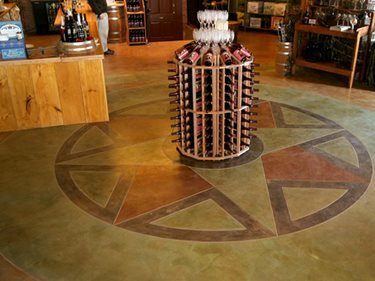 Learn more about creating grand entrances using concrete floors. 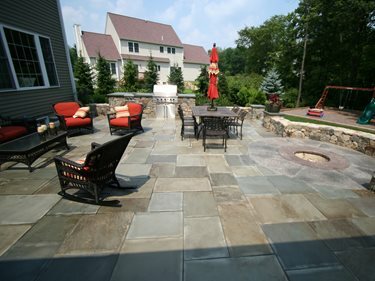 Design ideas for outdoor scoring:Additionally, scored patios, pool decks or driveways are typically more affordable than natural stone paving or stamped concrete and are especially popular with homeowners looking to upgrade existing surfaces. Grid patterns are also common outdoors, but there are a variety of other popular patterns as well. Scoring is often used to transform concrete pool decks, both examples above feature grid patterns, but with a bit of a twist. The pool deck on the left has accent squares stained a darker color at certain points where the grid lines meet, while the one on the right has a typical grid design, but on top of stained and textured concrete. Seamless stamped concrete with score lines is an excellent option if you are having new concrete poured. 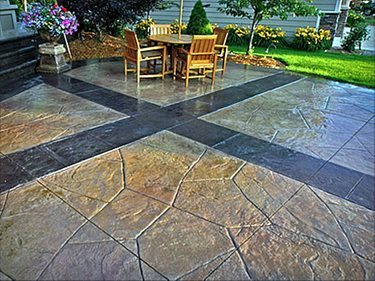 Your patio, or any outdoor concrete surface for that matter, can be scored with a pattern that mimics natural stone. 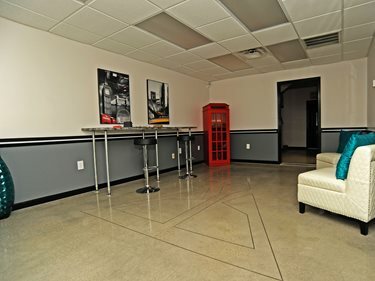 Typically it is much easier and more authentic looking to mimic cut stone which has straight edges; however a skilled decorative concrete contractor can score concrete to have a random stone or crazy paving pattern. A larger pattern with one stain color, as seen in the left image above, will be more affordable, while a smaller pattern with multiple colors, as seen in the image on the right, will cost more. Get more patio design ideas. Bands and borders are also commonly scored into exterior concrete. For the patio above, parallel score lines and a contrasting color were used to create decorative bands that intersect in the middle of the patio. For the driveway, a border was scored along the edges resulting in a clean, finished look. In this case, a secondary color was not used, showing that score lines are still effective, even when using only a single color. How scoring is done:Special equipment must be used to score hardened concrete. 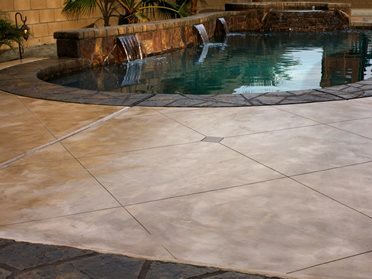 Diamond masonry blades are the choice of most decorative concrete contractors. However, for more detailed patterns, concrete engraving equipment may be used. If you know you want a scored pattern before your concrete is poured a groover can be used to make the lines in the fresh concrete instead of using a saw. Score lines do not have to be as deep as control joints, ¼” is sufficient, whereas joints must be cut to 25% the slab’s depth.